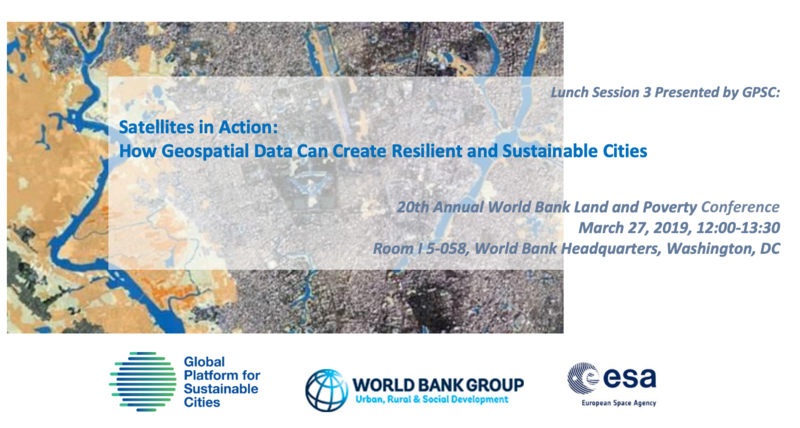 The Global Platform for Sustainable Cities (GPSC) cordially invites you to lunch session “Satellites in Action: How Geospatial Data Can Create Resilient and Sustainable Cities” jointly co-organized with the European Space Agency (ESA) and City Resilience Program (CRP). The session will demonstrate how geospatial data could be utilized in different urban development stages to improve planning and resilience, and to help cities achieve sustainability. After a brief introduction to the ESA-WB partnership, the Earth Observation for Sustainable Development (EO4SD) initiative’s dedicated activity cluster on urban development will be presented by GAF, EO4SD-urban consortium lead. Collaborative work linked to multiple World Bank operations will be highlighted as well as associated data and service support outlined. Experts will then join a roundtable to share their project experience and insights into how urban planners and policy-makers could be empowered by using spatial data and technologies, e.g. facilitating evidence-based urban planning process in two GPSC Indian cities Bhopal and Vijayawada, strengthening urban resilience through spatial data among CRP networks, and informing future implementation of city master plan based on evidence drawn from seven Tanzania cities. GPSC brings collaborators together to scale-up sustainable development solutions that promote an integrated approach to urban planning, management, and financing. Led by the World Bank and supported by the Global Environment Facility (GEF), the platform comprises 28 cities across 11 countries and a wide range of collaborators which include multilateral development banks, the United Nations, and various other institutions, experts and Knowledge Partners. GPSC supports urban sustainability by carrying out knowledge sharing and capacity development activities and connecting cities under three pillars: sustainability indicators and tools, integrated urban planning and management, and municipal finance. The World Bank Group’s (WBG) City Resilience Program (CRP) is an effort to assist city governments to build greater resilience to climate and disaster risks. For many cities in the world, strengthening urban resilience is a multibillion-dollar agenda that requires strong partnerships and new sources of capital. CRP bridges that gap by: (i) leveraging the WBG’s broad set of sectoral expertise in designing urban resilience projects; and (ii) better connecting cities to the necessary financing. The Resilience Enhancement Track of CRP focuses on shifting from a siloed sectoral approach to an integrated approach to help cities incorporate resilience into upstream urban planning. This track features using spatial technologies to allow cities visualize the inter-related nature of disaster risks and ensure any project design is risk-informed. The European Space Agency has been working in partnership with the World Bank Group since 2008. The current initiative linked to this strategic partnership, Earth Observation for Sustainable Development (EO4SD), got kicked off in 2016 and is dedicated to support the uptake of satellite-based information in development operations, following a systematic, user-driven approach to meet long-term strategic information needs in IFIs and client countries. A set of 10 thematic priority domains were identified and are addressed through dedicated EO4SD activity clusters, each implemented in collaboration with the WB and other IFIs though ESA-funded consortia of European EO service providers. EO4SD-urban is one of three initial clusters that started in 2016 alongside EO4SD-agriculture and EO4SD-water. In 2018 four more clusters joined EO4SD addressing the areas of climate resilience; disaster risk reduction; fragility, conflict, and security; and marine and coastal resources. GAF AG is a leading European geo-spatial company based in Munich Germany and the EO4SD-urban consortium lead partner. GAF has 30+ years’ experience in providing comprehensive quality controlled, end-to-end service portfolios: earth observation data, geo-products, integrating space technologies (satellite communication, earth observation and positioning) for thematic applications in agriculture, forestry, the urban domain, geology etc. for a variety of clients and international programs. UNIDO is the specialized agency of the United Nations that promotes industrial development for poverty reduction, inclusive globalization and environmental sustainability. The mission of the United Nations Industrial Development Organization (UNIDO), as described in the Lima Declaration adopted at the fifteenth session of the UNIDO General Conference in 2013, is to promote and accelerate inclusive and sustainable industrial development (ISID) in 168 Member States.